Remember those vintage images of iconic players (think Palmer and Nicklaus) holding a finish or posing with putter in air? Well, chances are they’re rocking a colored golf glove. Somewhere along the way though, the realization that plain white gloves could be mass-produced at much lower costs than their colored counterparts left these eye-catching accessories near extinct. Thankfully, the vibrant colored gloves of old are back and better than ever. And while I’m welcoming their resurgence with open arms, the question remains: Is it really worth dropping upwards of $35 on a premium colored golf glove? Let’s explore. Want the latest style tips and exclusive brand offers? Join The Dapper Drive Crew. There are 3 key elements to consider when deciding if premium colored gloves are for you. When it comes to a golf glove, nothing’s more important than fit. After all, it’s your only connection to the club. Consistency is key here and if you buy five different size large gloves from the same manufacturer, there’s an expectation that they’re each will fit identically. This is a huge. Often times, this is a big issue with cheaper manufactured colored golf gloves. They may tout the use of high-quality leather, but when it comes to fit, they often fall short of par. An ever important contributing factor toward fit are the design details of the glove. Each detail — from glove construction and finger stitching methods to strap and velcro components — will have a dramatic impact on the consistency of fit. 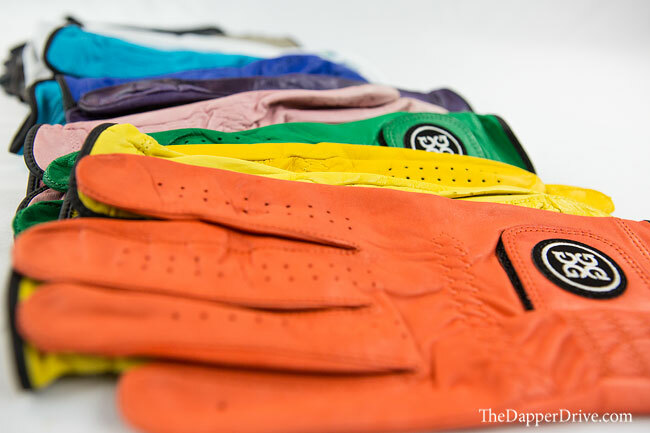 Cutting corners isn’t an option, and companies like G/FORE (the brand we have to thank for the colored glove’s 2011 revival) are setting the gold standard for premium colored gloves. So how do these things perform out on the course and in the elements? After all, if you’re dropping a decent amount of cash on a glove, you want to be sure it’s going to last. Most of the higher-end colored gloves utilize a premium AA Cabretta leather which translates to soft feel and comfortability. Comfort is obviously a good thing, since you’ll be slipping it on-and-off for the better part of four hours. And they carry just enough tackiness to promote a better grip on the club and perform in a variety of on-course elements. When it comes to durability, these are fantastic. My go-to glove is the G/FORE Collection Glove. Though I own a variety of colors that I rotate in-and-out, I tend to wear the Patriot more than most. After a few years of wearing G/FORE gloves, I finally tore my first. It saw the better part of 50+ rounds (many in the hot summer) and countless range sessions! Point being, they’re going to last. 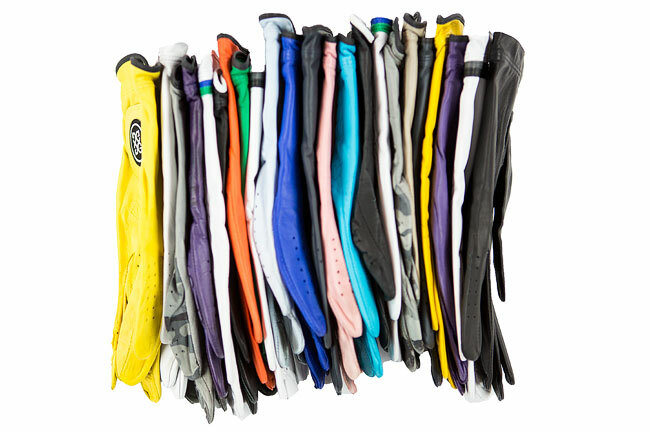 Though I think there’s a place in every golfer’s accessory drawer for the standard white glove, nothing beats the added flare of a colored golf glove. Whether the goal is to tie a look together or make an otherwise muted look pop (sorta like a pocket square in your blazer), colored gloves are an unmatched way to elevate your on-course style. 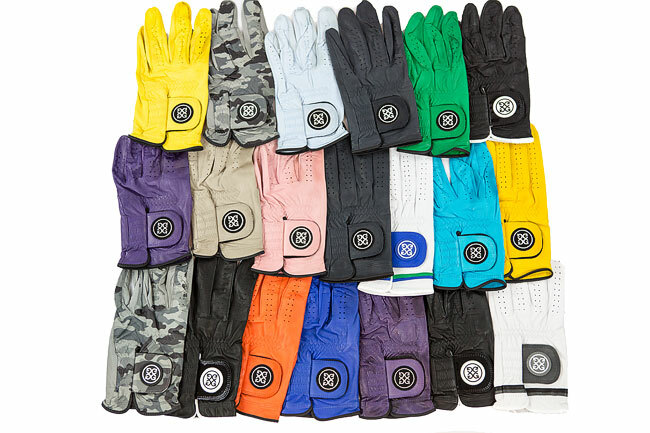 G/FORE offers a ridiculously wide variety of different colors and styles of premium gloves and I personally love expressing my current mood and vibe through the different options. I routinely pair a head-to-toe blacked-out look with the Onyx or Special Edition Delta Force Camo glove, but also enjoy throwing on a brightly colored Tangerine or Fly colored Collection glove to make the look pop. Options are endless. 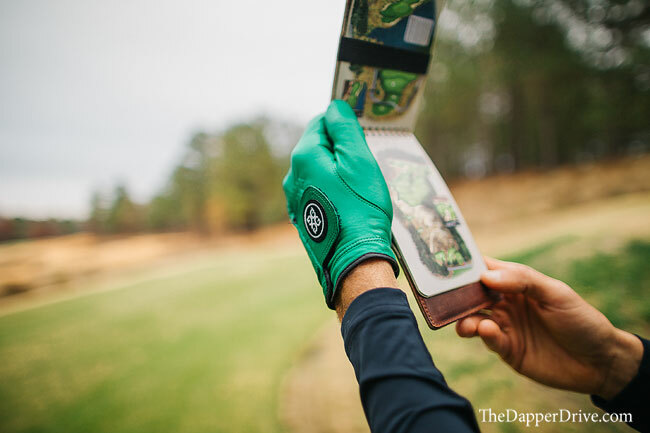 If you want to elevate your on-course style, and dig a well-fitting and long-lasting glove, then these premium golf gloves are well worth the cash. Sure, you’ll stumble across some brands that are offering-up colored gloves at lower prices, but I’d be hard-pressed to believe that the quality, durability, selection, and painstaking attention to detail of G/FORE can be beat. My recommendation? Pick up 3 G/FORE gloves — a darker/neutral, a lighter/muted color, a bright/vibrant color — and you’ll be more than set for the golf season ahead. 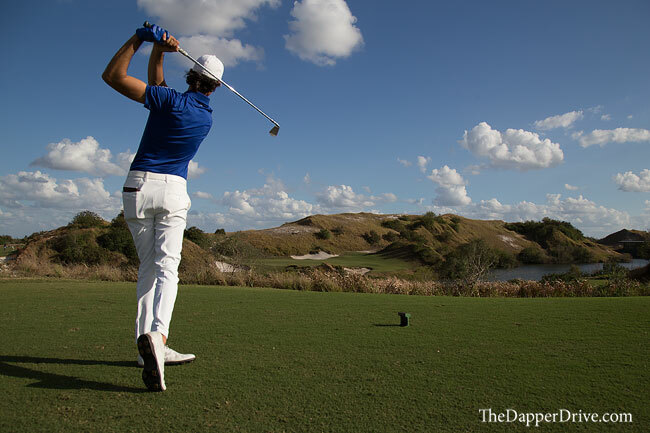 Join The Dapper Drive crew and receive periodic style tips, brand discounts, and chances to win fashionable golf apparel. Hey Kevin — 50 is an estimate, but yes! They are really durable. As soon as I’m done using a glove, it immediately goes back into it’s glove case that in came in. It really really extends the life of any glove vs. strapping or just tossing in your bag. The glove won’t ever really get “crunchy” which is common if you leave a sweaty glove out of the case. Otherwise, nothing too special I do. I have quite a few gloves in rotation now, but honestly I think if you pick up 2-3 and rotate them (and keep in case), the life of a high-quality, premium glove will be quite long (at a minimum I’d say you’ll have them all for the duration of the year). I tend to wear my black / navy gloves more often than most though so they get a lot of use but as mentioned in the blog post, I’ve literally only had to toss 1 G/FORE glove so far. Hope this helps!